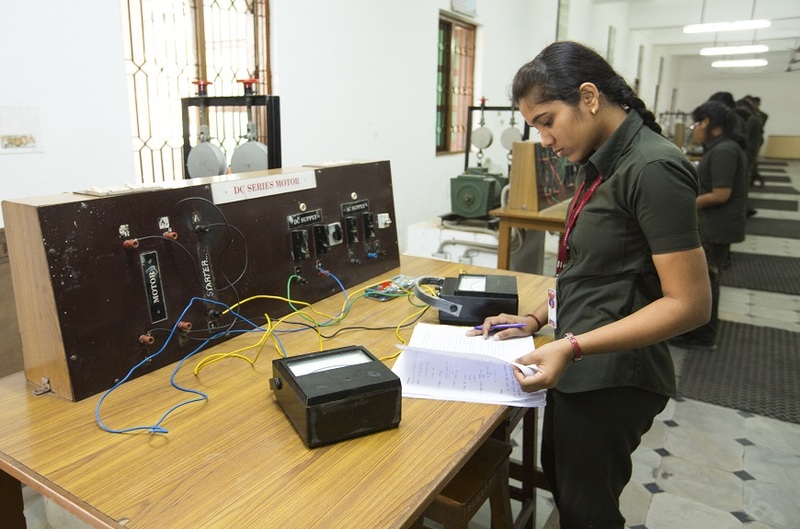 The Department of Electrical and Electronics Engineering strives to be a Centre of Excellence in education and technical research, in the endeavour of which the Department will continually update the teaching methodologies, progress in the emerging technologies and continue to play a vital role in the development of the society. M1: To develop the ability to learn and work creatively that would enhance the ability of both students and faculty to do innovative research. M2: To create and maintain state-of-the art facilities which provide students and faculty with opportunities to analyse, apply and disseminate knowledge globally. M3: To impart the knowledge in essential interdisciplinary fields which will enhance the interpersonal skills, team work, professional ethics and make them work effectively for their own benefit and the betterment of the society. M4: Prepare students for lifelong learning of theoretical and practical concepts to face intellectual, economical and career challenges. PO1 Engineering knowledge: Apply the knowledge of mathematics, science, engineering fundamentals and electrical engineering specialization to the solution of complex engineering problems. PO2 Problem analysis: Identify, formulate and review research literature and analyze complex electrical engineering problems, reaching substantiated conclusions using first principles of mathematics, natural sciences and engineering sciences. PO3 Design/development of solutions: Design solutions for complex electrical engineering problems and design system components or processes that meet the specified needs with appropriate consideration for the public health and safety and the cultural, societal, and environmental considerations. PO4 Conduct investigations of complex problems: Use research-based knowledge and research methods including design of electrical experiments, analysis and interpretation of data and synthesis of the information to provide valid conclusions. PO5 Modern tool usage: Create, select, and apply appropriate techniques, resources, and modern engineering and IT tools including prediction and modeling to complex electrical engineering activities with an understanding of its limitations. PO11 Project management and finance: Demonstrate knowledge and understanding of electrical engineering and management principles and apply these to one’s own work, as a member and leader in a team, to manage projects and in multidisciplinary environments. PO12 Life-long learning: Recognize the need for, and have the preparation and ability to engage in independent and life-long learning in the broadest context of electrical technological change. PSO1 Professional Skills: Apply the knowledge of Mathematics, Science and Engineering to solve real time problems in the field of Power Electronics, Electrical Drives, Power Systems, Control Systems and Instrumentation. PSO2 Research and Innovation: Analyze and synthesize circuits by solving complex engineering problems to obtain the optimal solution using effective software tools and hardware prototypes in the field of robotics and renewable energy systems. PSO3 Product development: Develop concepts and products by applying ideas of electrical domain into other diversified engineering domains. PEO1 Strengthen the knowledge in Electrical and Electronics Engineering to enable them work for modern industries by promoting energy conservation and sustainability. PEO2 Enrich analytical, creative and critical logical reasoning skills to solve problems faced by emerging domains of electrical and electronics engineering industries worldwide. PEO3 Develop effective communication and inter-personal skills to work with enhanced team spirit in multidisciplinary projects with a broader ethical, professional, economical and social perspective. PEO4 Prepare the students either to establish start ups or to pursue higher education at reputed institutions. JEPPIAAR NAGAR, RAJIV GANDHI SALAI, CHENNAI-119.